Batik is a legacy of ancestors that has occurred in our daily lives. In the city of Kudus, there are also batik permits that highlight typical sacred motives, namely, temples, towers, Parijoto. The process of making batik requires a long time, making it possible to speed up the manufacturing time. One way to improve batik making is to use work facilities. Work facilities consisting of batik must meet ergonomic aspects.The method in this Research is to measure the anthropometric data of batik. The batik anthropometry data used are wide hip, high poplitea, long poplitea, shoulder height sitting and elbow height sitting. After the batik anthropometric data is obtained, then the data is tested for normal distribution, uniformity test and adequacy test. Then calculate the percentile value of the anthropometric data. Percentile value data used to determine the size of the ergonomic ergonomic chair to be designed. Productivity is obtained from the analysis before and after the ergonomics screwdriver.The results of this study have occurred ergonomic batik with a size of 30.62 cm for high chairs; 42.81 cm for wide seats; 43.46 for chair length; 50.96 for seat back height and 21.52 for elbow back height. While the results of the value of productivity after the ergonomics preparation of batik is obtained by 20%. SOKHIBI, Akh; SUGIHARTO, Wibowo Harry. PERANCANGAN KURSI ERGONOMI PEMBATIK PADA UKM BATIK ALFA SHOOFA KUDUS SEBAGAI UPAYA PENINGKATAN PRODUKTIVITAS. 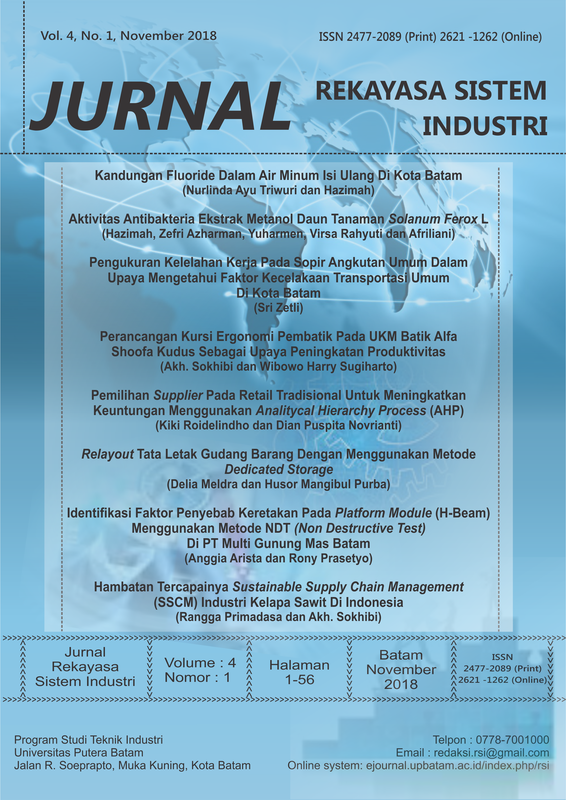 JURNAL REKAYASA SISTEM INDUSTRI, [S.l. ], v. 4, n. 1, p. 18-25, nov. 2018. ISSN 2621-1262. Available at: <http://ejournal.upbatam.ac.id/index.php/rsi/article/view/691>. Date accessed: 26 apr. 2019. doi: https://doi.org/10.33884/jrsi.v4i1.691.